Anthony Jolly’s eclectic coffee house has blossomed into a de facto community center, where patrons also gather to chill, work, organize or perform at the open mic on Saturday nights. 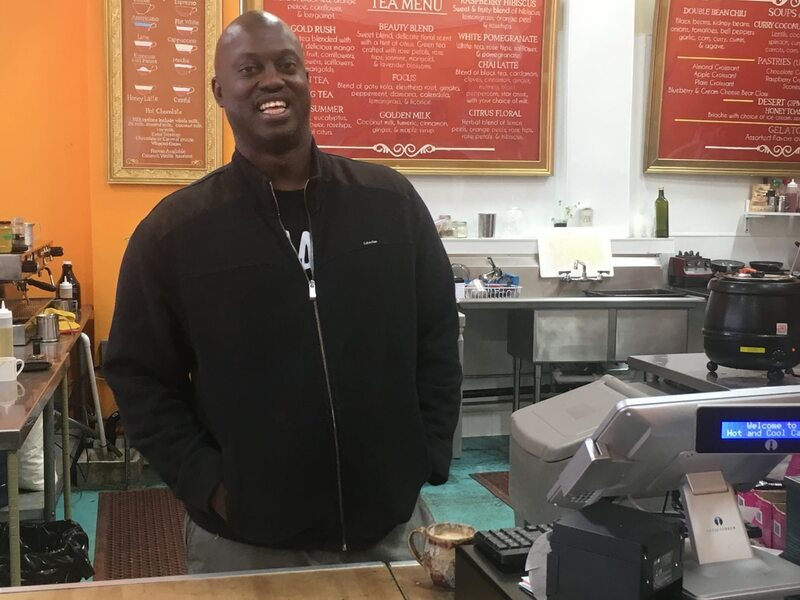 African American entrepreneur Anthony Jolly opened Hot & Cool Café in South L.A.'s historic Leimert Park neighborhood six months ago. In that short span of time, the eclectic coffee house has blossomed into a de facto community center, where patrons also gather to chill, work, organize or perform at the open mic on Saturday nights. Jolly got his start as a barista at a Starbucks in his hometown of Washington, D.C., twenty years ago. But he remembers that first cup of Ethiopian specialty coffee like it was yesterday. "It tasted like blueberries," he chuckles. But Jolly says he didn't just fall for the coffee; he also fell in love with the culture. "The second thing that excited me about coffee — the coffee house aesthetic itself," explains Jolly. "I worked at a Starbucks located across the street from a Washington D.C. courthouse. Every day there were two lines of lawyers waiting to get their morning java. Seeing those people every day, it became a community. I knew about their lives, I knew about their struggles, I knew about their happiness." The self-styled coffee hunter spent a significant amount of time traveling and working in Ethiopia to learn the tricks of the trade from local farmers and businesspeople. On his last journey to the motherland, Jolly secured a deal to distribute the high-end beans that produce the exclusive, farm-to-cup coffee he serves at Hot & Cool Café today. "We have one Ethiopian Coffee — it's called Karkasa," Jolly beams proudly. "It's a woman-owned farm: 50 acres, 100-year-old trees, still producing fruit… And it's the first time it's been in the United States." Hot & Cool Café is open every day from 7 a.m. to 10 p.m.